The Royal Train N.E.Ry. Leaving York .From a Painting by F. Moore. N.D. but 1900. Varnished chromo lithograph, 15”x 9” by Alf. Cooke &Sons, Leeds. Illustration for a Trade Calendar. “The varnish for these engines is manufactured by ROBT. INGHAM CLARK & Co. Ltd”. It is perhaps a bit misleading to caption this picture “Royal Train”. True, it is a train and Royalty are on board, but apart from the leading vehicle, a former Stockton & Darlington saloon converted for to be used as a saloon by North Eastern Railway Officers, and the solitary Great Northern Railway Royal Saloon built by Cravens in 1889, everything else is normal everyday East Coast Joint Stock starting with the six-wheeled full brake next to the NER saloon with another of the same bringing up the rear. The Craven’s twelve-wheeler, much shortened by perspective, is the fourth vehicle with larger windows. This will be replaced in 1906/7 by a new King’s Saloon built at Doncaster and a Queen’s Saloon built at York. On the occasion depicted the passengers are the Prince and Princess of Wales, soon to become King Edward, and Queen Alexandra, and they are on their way from York to an engagement in the North East. The North Eastern Officers in attendance travelling in the saloon will have included H.A. Watson, NER General Supt. as Officer-in-Charge, Vincent Raven NER Loco. Running Supt (unless he chose to travel on the footplate), and at least one Director. If as I suspect the train had originated earlier that day somewhere on the Great Northern, then J. Alexander, GNR Supt. of the line may also have been present. There must have been some form of communication between the saloon and the locomotive. Also, as there are no corridor connections between the saloon and the Royal Suite a temporary telephone or bell system must have been installed. The painting is based on a photograph by Dr. Tice F. Budden, a pioneer in the craft of photographing moving trains with minimal blurring, in those days of slow emulsion and shutter speeds. He did this by carefully choosing the background and angle of the shot and panning the camera with the train. Thus the train was sharp while the nondescript background was blurred. The location is Poppleton Junction (since renamed Skelton Junction) on the northern outskirts of York. The railway lines on the right are the up and down Harrogate Branch. . 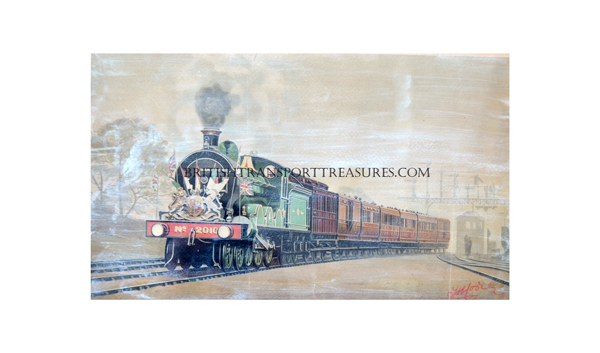 The locomotive is of class “S” introduced the previous year by NER Chief Mechanical Engineer, Wilson Worsdell, the first passenger 4-6-0 locomotives in Britain. (David Jones’ 4-6-0 on the Highland was intended for goods traffic). A last flowering of late Victorian elegance in locomotive design, they were intended to work the heaviest East Coast trains in conjunction with H.G. Ivatt’s “Klondyke” Atlantics but with small fireboxes they were deficient in heating surfaces and they were disappointing, poor steamers. No. 2010, fresh out of the works, was one of the last batch to be built. Lessons were learnt and the next class of NER express locos, the “V” Atlantics, would have large wide fireboxes. Despite being behind glass the varnish coating has deteriorated through having spent 60 odd years over the fireplace in Starbeck South Signal Box but it is still an attractive item with a story to tell.